Commercial businesses want flooring that is both beautiful and durable. They need something that will stand up to the high level of usage and that won’t require a lot of maintenance. Engineered wood flooring is an ideal option for businesses that want a beautiful, yet tough, floor. Engineered wood is stronger than standard wood, and it comes in a variety of finishes. Oil finished is a popular option for clients that want a wood floor with a natural, aged look. What type of foot traffic do you typically have on a daily basis? What type of work is done on the floor itself, such as the use of machinery or equipment that may stress the floor? Do you have clients coming in and out frequently? What type of maintenance and cleaning schedule do you already have in place? Do you want to change the entire look of the floor? What are the chances of spills or accidents happening on the floor, such as a shop that is constantly working with liquid items that could stain or harm the floor itself? Asking these questions will help determine which floor will work best for your client. In many instances, an oil finished engineered wood floor can be a very attractive and functional choice. One benefit for commercial clients is that an oil finished floor is very easy to fix if damage occurs. While it might not be as durable as cement, if the oil finished floor is scratched, it's very simple to repair and refinish. This is a huge benefit to those in fast-paced, busy businesses such as restaurants or hotels. The ease of repairing the floors through sanding and refinishing makes it appealing to those who deal with a lot of foot traffic on a daily basis. It gives clients peace of mind that they won’t have to undertake a huge project just to fix a few scratches or dings. Natural wood floors are rising in popularity and show no signs of slowing down. When your client desires a natural look to their wood floors, oil finished is the perfect way to go. This type of finish gives your client a beautiful, natural wood look without a lot of hassle or upkeep. 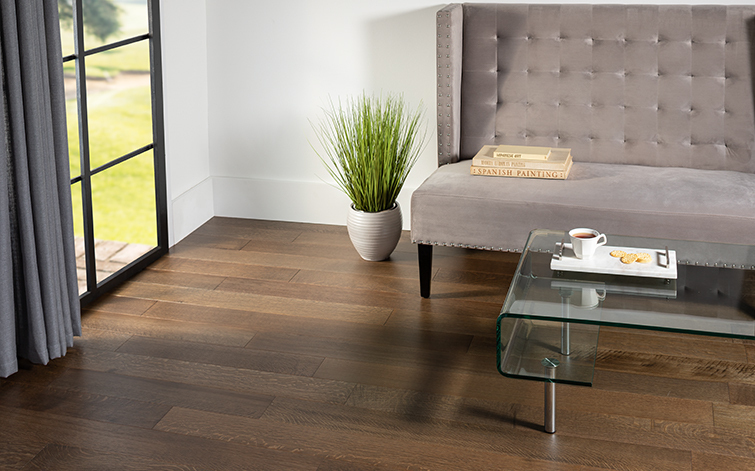 Despite being an engineered product, an oil finished wood floor will look just like a standard wood floor. Clients wanting a rustic, distressed or weathered look to their space will find oil finished to be a trendy choice that comes with less upkeep. Another benefit your client will receive is the very low sheen that this finish gives off. Some finishes, such as urethane finishing, can give quite a high-sheen, glossy look to the floor. Unless the client specifically asks for this type of look, a low-gloss floor is usually the best choice. Why? Low sheen floors tend to hide scratches, scuffs and dirt on the floor's surface. The glossier the floor, the more apparent any blemishes and debris will be. Eco-conscious clients may desire or even require a floor that is appropriate for green building designs. Oil finished engineered wood floors are a safe choice for these types of projects. The oils used to seal the floors have no volatile organic compounds (VOCs). This means they promote a safer and healthier indoor environment for building occupants. They also are safer for the environment and won't off-gas dangerous fumes. Oil finished floors are a great advantage to business owners who are conscious of their impact on the environment but also need a floor that meets the high standards of modern architecture. Clients will likely have a budget for their flooring, and typically, the more affordable the floor, the better. Oil finished engineered wood flooring is more cost-effective, both in terms of upfront costs and long-term care. Oil finished engineered wood tends to be less expensive than other finishes. And when it comes to maintenance and keeping it looking fresh, it's very easy to care for. With regular cleaning using the correct type of soap and water, these floors can look newly finished for years to come. Be sure to discuss all the aspects of your client’s business to help them truly see the benefits oil finished wood floor brings to their building. Go over the installation process with them and make sure that they understand how to keep the floors looking their best. 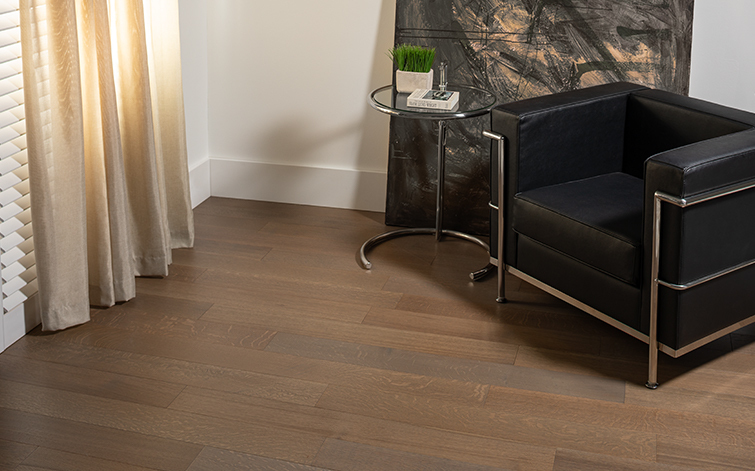 Clients that want a handsome floor with real-wood appeal and the resilience of a commercial floor will find engineered hardwood to be an ideal solution. If you are interested in seeing engineered hardwood up close, request a sample from Nydree Flooring today.